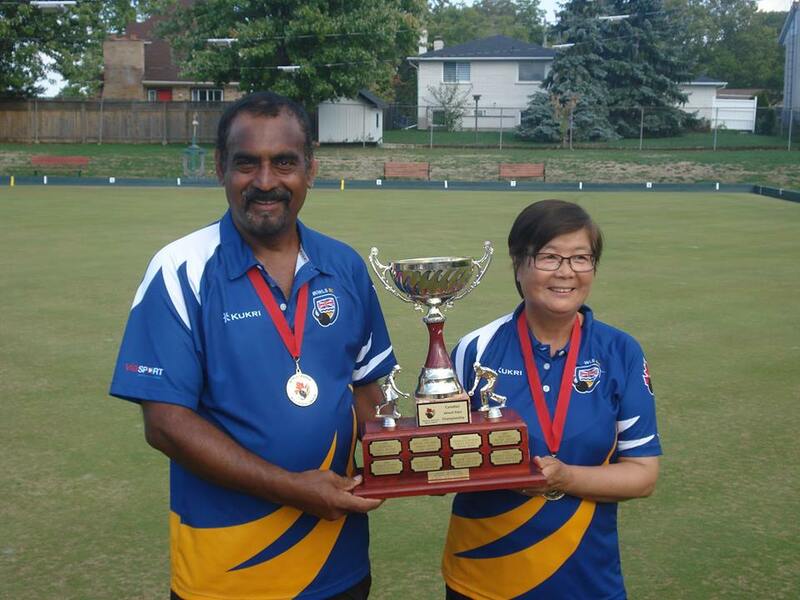 Josephine Lee and Hirendra Bhartu have won their 5th Canadian Mixed Pairs Championship. It was a great day as the weather held for 2 days and the greens sped to about 12 secs. When speaking with Bhartu he had this to say ” these conditions suited us better than our opposition”. Team BC started the day of in a tie-break situation as they first defeated Ontario West 27-6. It was a not a full game as it was called after 15 ends. With that win it would move them into the Gold Medal match where Manitoba A had already booked their spot and was waiting for the Winner between ON and BC. In the Round Robin play it was Manitoba that handed BC a loss in a close game 19-17. But things would change on the Championship day as Team BC continued its great play to win the 2016 Canadian Mixed Pairs Final 17-9. They shook hands after 16 as the score card read 5 ones and two 2’s for their nine points. Hirendra Bhartu said; “We met our goal of not allowing any more than 2 in any end. That will usually result in a win”. “Thanks to the Glenridge club for their Hospitality and a special thank you to Patrick and Donna of Ontario West who were our daily ride givers from the Hotel to the Greens and back. Thank you to Josephine for going into Provincial Sunday mode by hammering the jack end after end. Makes it easy on the skip. Thank you Bowls BC”. Congratulations to Josephine and Hiren on another great run at the Mixed Championships as you made your Province proud! Also Congratulations to all the players that made their way to St. Catharine’s for the event!